Contractor-turned-homebuilder Fernando Pages Ruiz gives hands-on instruction for constructing frost-protected shallow foundations. Because moisture in soil can create an "ice lens" – an area where ice crystals form and bulge, exerting vertical pressure – building footings have traditionally penetrated deeper than the maximum seasonal frost penetration in any given climate to prevent these vertical forces in frozen ground directly under the footings from lifting the foundation and damaging the structure. In many areas, frost depth exceeds 42", resulting in footings far deeper than those needed structurally. 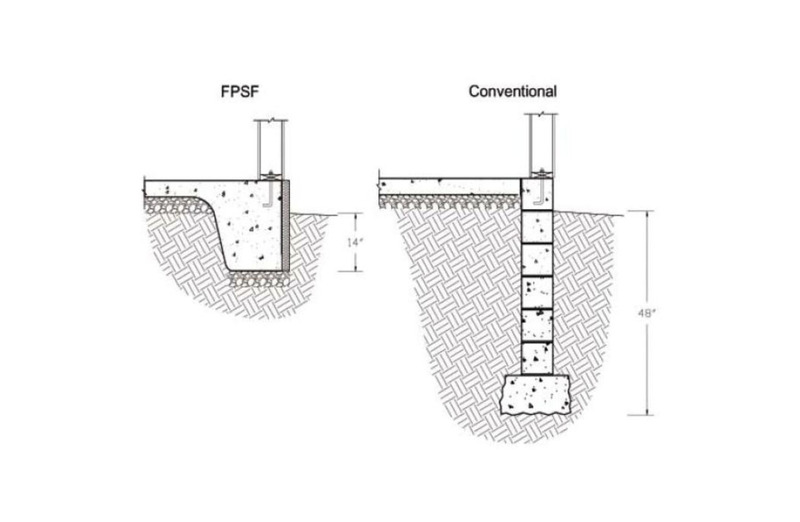 The frost-protected shallow foundation (FPSF) method allows footings averaging about 16" deep or less in most areas of the continental United States. (See Figure 1 below.) The method saves money and material resources. Because it uses insulation to prevent frost from developing under the footings, the method also saves energy by slowing heat loss into the ground from a conditioned structure. The method has been in use for more than 50 years in northern Europe. The International Residential Code (IRC) has recognized the FPSF method since 2000 with prescriptive requirements for heated buildings, and through reference to ASCE standard 32-01 for semi- and unheated structures. For a heated building, the careful placement of insulation around the exterior perimeter of the footing and foundation wall captures warmth from the building and geothermal heat to temper the soil under the footings and effectively “elevate” the frost depth. 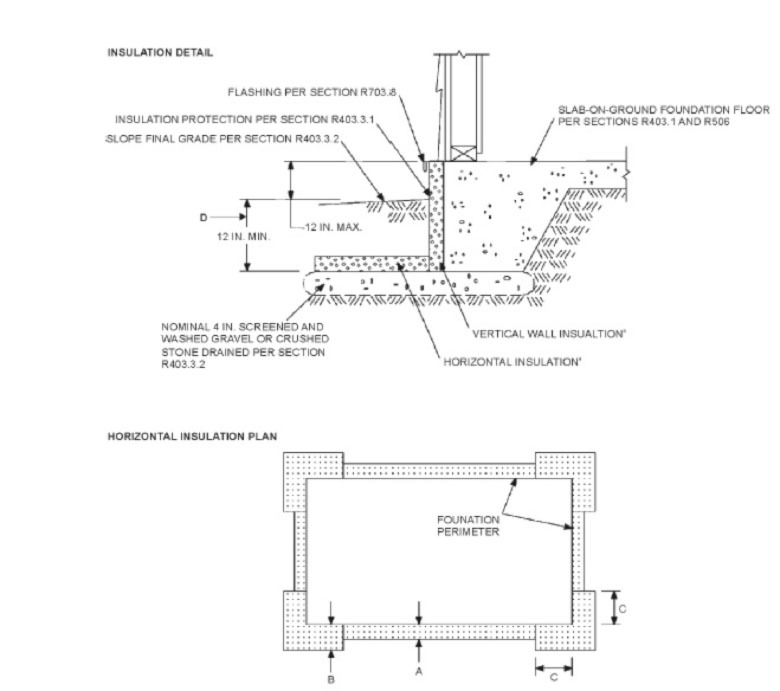 Although FPSFs are primarily used for slab-on-grade construction, the method also works well with stem wall foundations and unventilated crawlspace foundations and in remodeling, when the shallow dig minimizes disturbance around the building, and in walkout basements, when insulating the foundation on the downhill side of the structure is beneficial. Although no prescriptive methods are provided by the International Building Code (IBC), the FPSF method also applies to commercial and agricultural construction via reference to ASCE standard 32-01. The subtleties of FPSFs require careful study, but when builders understand and practice the FPSF method, they learn the requirements for a given area; then the construction of a FPSF is no more complex than that of a traditional foundation. 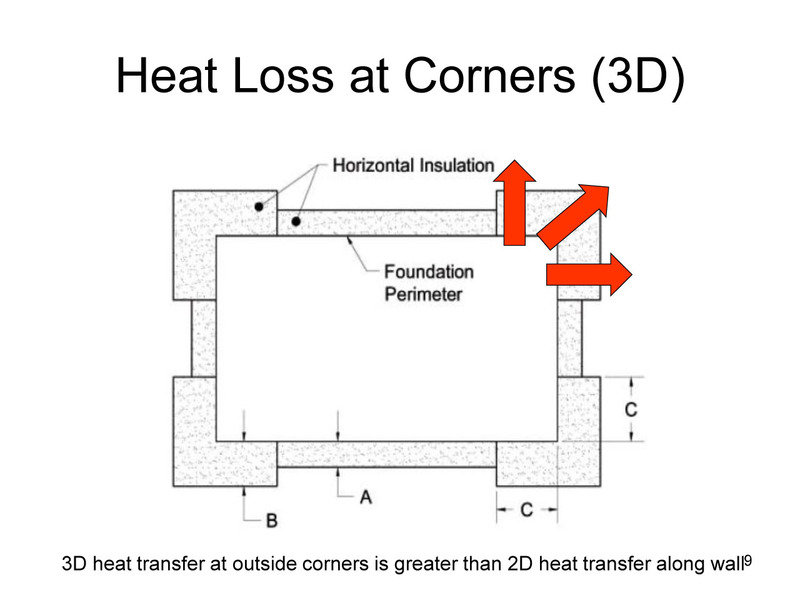 Builders should know the ABCs before beginning a FPSF: the minimum depth for a FPSF in that climate zone, the minimum insulation requirements, and whether the insulation will need to be only vertical on the face of the foundation and footing or vertical with horizontal extension from the perimeter (see Figure 2 below). Figure 2. 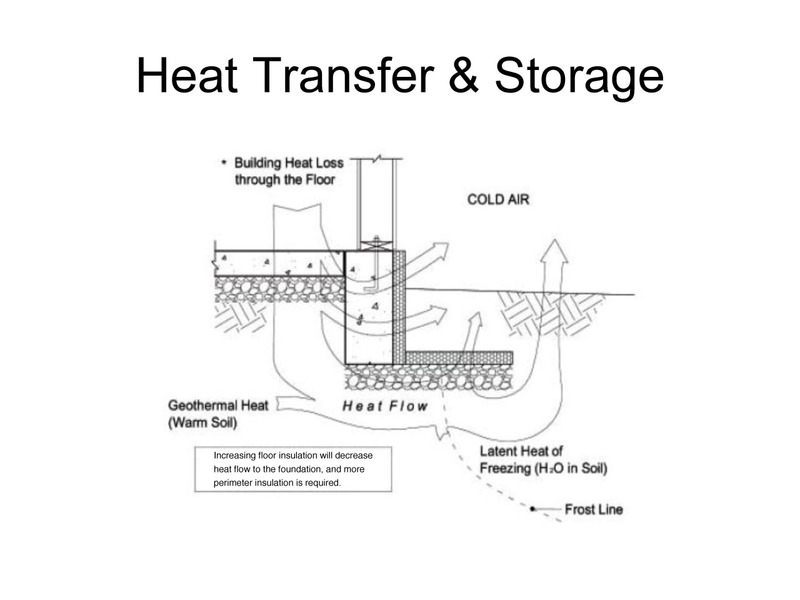 Frost-protected shallow foundation heat flow diagram for a heated building. The International Residential Code (IRC) provides a simplified, prescriptive method of determining the depth of your footing, as well as the type of insulation required and its installed location. To start, you will need to reference the Air-Freezing Index for your construction site. The Air-Freezing Index is an indicator of the combined duration and magnitude of above- and below-freezing temperatures occurring during any given winter. The IRC provides a color-coded, Air-Freezing Index contour map (see Figure 3 below), which works well in most areas, except transitional areas (where the Air-Freezing Index moves from one set of specifications to another). Builders can generally obtain accurate local information at the municipal building department and find more comprehensive charts online at the National Climatatic Data Center (NCDC). International Code Council report 403.3 (ICC R403.3) also provides a state-by-state guide with county-by-county references. Figure 3. Air-Freezing Index map. Source: ncdc.noaa.gov. Once you know the Air-Freezing Index value for the area you will build, consult ICC Table R403.3(1), Minimum Footing Depth and Insulation Requirements for Frost-Protected Footings in Heated Buildings (see Table 1) and then cross-reference with the Air-Freezing Index data to arrive at the minimum footing depth, as well as the R-value and placement of the insulation required. You will note that most areas with an Air-Freezing Index value of 2,500–4,000 require only a 16" footing depth; areas with a Air-Freezing Index value below 2,500 require even less depth, saving considerable excavation and concrete. Trade tip for winter construction. As you study the FPSF method in preparation for your first project, you will read warnings about freeze protection during construction. In theory, your foundation should be completed and the building enclosed and heated prior to the first frost. It’s a good rule to follow, but don’t panic if your foundation gets caught out in the cold – everything will be OK. The system is designed very conservatively, and I have built many foundations in late autumn that were not covered, much less heated, before winter came, and none suffered any damage whatsoever. I know of other builders who have had the same experience, and I know from my structural engineer that this is not an exception. Again, the simple reason to build a FPSF under a heated structure is to to benefit from the heat generated by the building. It is best to complete the foundation, enclose the building, and heat it prior to winter, but the FPSF design is robust and (just like most building methods) has a margin of safety. It’s important to select the right rigid insulation, because only a few products can maintain an effective R-value below grade and throughout the expected lifespan of a building. I have not found suitable products at the local home improvement center and had to special order the material from my building material supplier instead. Rigid insulation comes in 4' x 8' sheets, so you must to cut to size. Insulation suitable for footings must be labeled as complying with ASTM C578, Standard Specification for Rigid, Cellular Polystyrene Thermal Insulation. The actual design values for FPSF insulation materials were calculated conservatively; the NAHB Research Center's Revised Builder's Guide to Frost Protected Shallow Foundations gave accepted design values of 10% less than the nominal R-value for extruded polystyrene (XPS) and 20% less than nominal values for expanded polystyrene (EPS), when applied vertically. I have always used extruded polystyrene (XPS) on the recommendation of my structural engineer. Extruded polystyrene (XPS) insulation is also suitable for the vertical and horizontal below-grade application, while expanded polystyrene (EPS) insulation can only be applied vertically. To determine what R-value you’ll need, refer to ICC Table R403.3(1) (shown above) and you will find the insulation R-values required for the vertical insulation and, if needed, those for horizontal insulation as well. Then cross-reference your findings with the Air-Freezing Index map. For example, looking at the Air-Freezing Index map, you will notice that most of the Front Range of Colorado, all of Nebraska, Illinois, and even northern Michigan lie in the 1,000–2,000 or warmer. By cross-referencing ICC Table R403.3(1), you will find that you will need a minimum R-value of 5.6 for the vertical insulation to build at that range of Air-Freezing Index values, with no horizontal insulation required. Trade tip for working under the IECC. 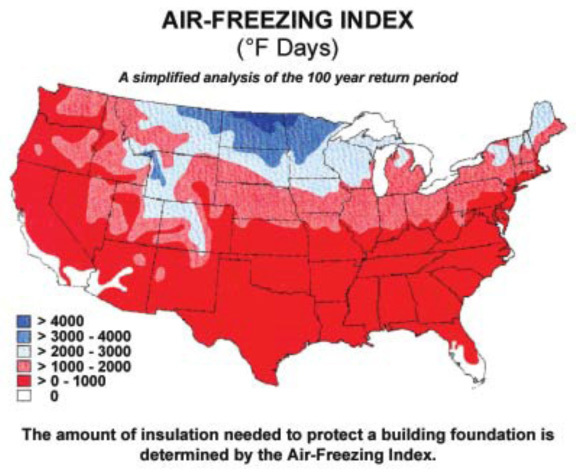 If you are working under the 2009 International Energy Conservation Code (IECC), you must consider that the foundation insulation requirements may meet or exceed those of the FPSF method; this means that you have no good reason to dig below the frost line to protect your foundations from frost, because the insulation you’re using already may be sufficient. Trade tip for installing horizontal insulation. If required, horizontal insulation must be bedded firmly on smooth ground and buried a minimum of 12" below grade. It’s easiest to overexcavate and then backfill the area under the horizontal insulation with a granular base (sand or pea gravel). When horizontal insulation extends more than 24", it must be protected by a hard surface, such as hard plastic, sheet metal, or even plywood, with backfill carefully placed to assure positive drainage of water away from the foundation. It also follows that any landscapers should avoid digging above the horizontal insulation. One of the easiest methods for installation of vertical insulation involves a three-step process. After digging shallow footings, we form the exterior perimeter of the footings, right up against the excavation trench, with extruded polystyrene (XPS) boards cut to 16" wide, laid horizontally, and staked to hold them in place. It’s important to avoid gaps between the boards, especially at corners and joints. To secure the rigid insulation, we weave tie-wire through the foam and around the wooden stakes, tightening it with a quick twist. When pouring concrete, we find that a slightly drier mix works best, to avoid getting a sloppy mix under the insulation, which can cause it to lift. You will have to place insulation over any exposed ledge of concrete at the top of the footing if your stem wall is recessed from the exterior perimeter of the footing. This is a step I have seen ignored many times (without consequence as far as I know), but why invite trouble? The idea is to completely wrap the exterior of the foundation with insulation to avoid cold bridges, or gaps in the envelope. Photo: Fernando Pagés Ruiz. Once the footings have set, we install a stem wall as is normally done on any footing. We use 2' tall aluminum basement wall forms or, in other areas, concrete masonry block or wood forms. Once the forms are stripped, or the block is grouted, we laminate rigid insulation onto the exterior of the forms by using an adhesive marked “suitable for use with foam board” or, more specifically, "suitable for use with polystyrene foam board." Avoid solvent adhesives because they will dissolve the polystyrene insulation boards. To a contractor experienced with slab-on-grade construction, all of this will sound like a lot of extra work, and it is. The easiest and most economical use of the FPSF method comes with a monolithic slab poured against a formed exterior perimeter edge lined with foam. To make sure the foam sticks to the concrete and not the forms, we have tacked the foam onto wood forms with double-headed nails, driven just enough to hold the insulation in place. Trade tip on termites. Anyone that builds in a heavily termite-infested area will have squirmed at the last suggestion I made in the preceding paragraph. Termites love burrowing behind foam insulation and find ready access to the yummy parts of a building without anyone noticing the tell-tale termite tunnels along the foundation wall. Unfortunately, this is one weakness of the FPSF and why the method is proscribed in areas of the country with significant termite infestation risk, such as South Carolina, Georgia, Florida, Alabama, Mississippi, Louisiana, the eastern half of Texas, and most of California. Because the insulation on the surface of the stem wall above grade remains exposed to the degenerative effects of ultraviolet light and to the mechanical assaults of lawn service equipment, you have to find a way to protect it. Many builders employ the same process and materials used to finish exterior insulation and finish systems (EIFS), beginning with polymer-cement base coat troweled over the foam insulation panels, followed by a fiberglass reinforcing mesh laid over the polystyrene insulation panels and fully embedded in the base coat, and finished with an acrylic color-integral finish coat troweled over the reinforcing mesh. The only problem with this system is that it is not recommended for contact with grade and certainly not for application below grade. I don’t know of any problems resulting from this method, but I developed a different method with which I felt more comfortable and which seems to provide a higher level of protection for the foam. To protect my stem wall insulation, I use aluminum coil, the same as is used to wrap fascia. To create a watershed over the insulation, I bend a “Z” shape counter-flashing pattern using a siding break along the top of the coil, and then I run the aluminum over the face of the insulation and 6" below grade, much as I would over fascia but upside down. Trade tip on caulking the seams. Be aware that the protruding edge of the foam creates a ledge on which water can become trapped and drain back into the building beneath the sill plate. The “Z” flashing method described above will keep water out of the building, but you have to be careful to caulk the laps. Otherwise water can back up between the joints, as it can on any horizontal flashing. Design criteria also exist to design FPSFs for unheated buildings, including garages and porches attached to a heated structure. This will be the subject of a third article introducing the FPSF method for unheated and semi-heated structures. 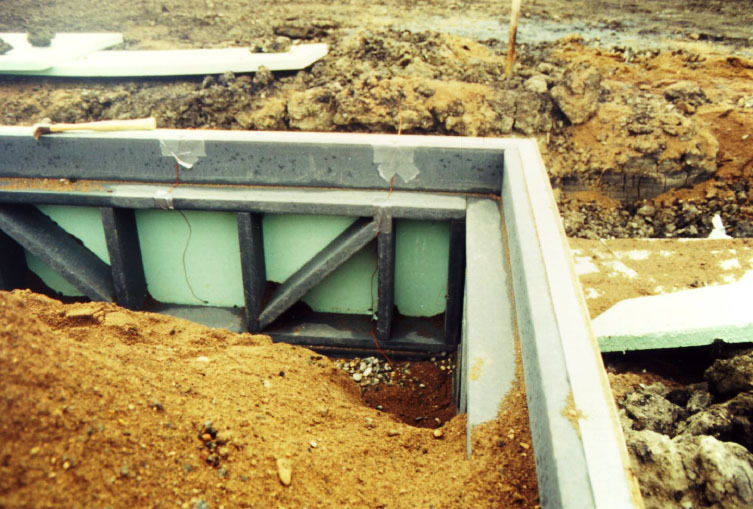 For more information immediately, you can purchase the American Society of Civil Engineers (ASCE) standard 32-01 for the Design and Construction of Frost-Protected Shallow Foundations at www.asce.org. For a comprehensive slide presentation on FPSFs prepared by Jay Crandell, P.E., former chief engineer for the National Association of Home Builders (NAHB) Research Center, now with Advanced Residential Engineering Services, click here. 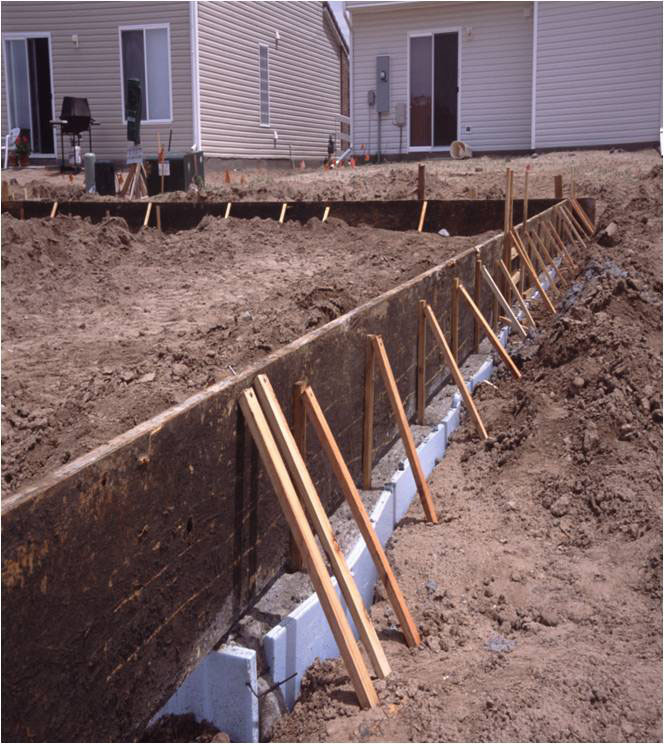 As energy savings and the conservation of resources increasingly drive decision-making for homebuilders, frost-protected shallow footings offer a good method for constructing slab-on-grade foundations. Homebuilder, developer and author Fernando Pagés Ruiz builds in the Midwest and Mountain States and consults internationally on how to build high-quality, affordable and energy-efficient homes. As a builder, his projects have numerous awards including the 2008 “Green Building Single Family House of the Year” and the 2007 “Workforce Housing Award” from the National Association of Home Builders. In 2006, the Department of Housing and Urban Development's PATH project chose him to build America's first PATH Concept Home, a home that is affordable to purchase and to maintain while meeting the criteria of LEED for Homes, ENERGY STAR, MASCO Environments for Living, and the NAHB's Green Building standards. A frequent contributor to Fine Homebuilding and EcoHome magazines, Pagés is also the author of two books published by the Taunton Press: Building an Affordable House: A high-value, low-cost approach to building (2005) and Affordable Remodel: How to get custom results on any budget (2007). Contact Fernando on facebook or by way of his website buildingaffordable.com.